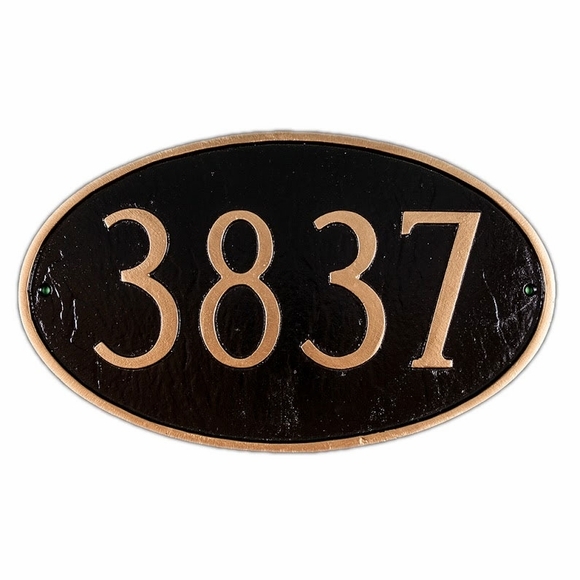 House Number Plaque - - personalized oval address plaque. Made in USA. 13.75"W x 8.5"H one-line sign. Click top link in Related Products to see this sign in a larger size. Exactly what I wanted. The plaque is elegant , simple and just perfect! Very easy to mount on brick with the aid of a small drill. The aluminum sign was just as ordered, shipping was fairly quick and installation was a snap. Sign looks great on our home.